Bythotrephes longimanus, the spiny water flea, is a predatory cladoceran native to northern Europe and Asia. It was introduced to the North American Great Lakes through ballast water and has since spread to a number of inland lakes. B. longimanus competes directly for prey with juvenile and small fish along with predatory zooplankton. It can foul fishing lines and downrigger cables, and can have substantial impacts on zooplankton community structure. B. longimanus exhibits a high degree of morphological variability both throughout its range and seasonally within a locality. Until recently several different species were recognised, although these are now seen to be simply manifestations of the extreme polymorphism of B. longimanus. Currently, only the species longimanus is recognised in the genus Bythotrephes (Rivier, 1998). Initial reports of Bythotrephes longimanus in North America referred to the organism as Bythotrephes cederstroemi. Sikes (2002) states that, \"Through parthenogenesis the spiny water flea can exhibit explosive population growth, but its ability to produce sexual eggs allows it to increase genetic variability as well as survive and disperse under adverse environmental conditions. Development time till primaparity (1st time mom) is not significantly different for the two modes of reproduction, averaging about 14 days. Sexually reproduced eggs can go into a semi-static metabolic condition called diapause. Through these sexual reproduced \"resting eggs\", the next generation of B. longimanus can overwinter and hatch usually when temperatures exceed 4ºC. The spiny water flea can survive a wide range of temperatures, but has lowest mortality between 5ºC and 30ºC. Its development time is temperature dependent and maximised between 20-25ºC without suffering higher mortality. 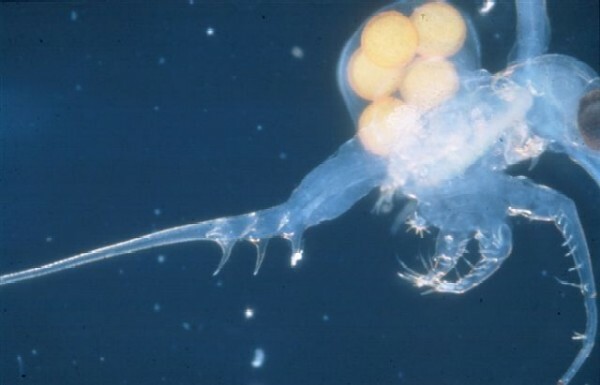 Besides protection from winter conditions, many diapaused eggs can also survive passage through fish digestive tract. A female with a full clutch is double her usual weight . This fact causes increased predation on pregnant females above their conspicuous body with a single large eye and long tail spine and thereby further aids in dispersal.\"
Straile and Haelbich (2000) report that, \"Because of its large body size and conspicuousness, B. longimanus is a preferred prey of freshwater fish.\" In the Great Lakes it has been shown to be a preferred prey of alewife (Alosa pseudoharengus) (Pothoven and Vanderploeg, 2004; Mills et al. 1992) and lake herring (Coregonus artedii) (Coulas et al. 1998). However, it is probably not utilised by smaller fish (Barnhisel and Harvey, 1995). B. longimanus is a Palaearctic species, native to northern Europe and Asia (Rivier, 1998). Within both its native and introduced range, MacIsaac et al. (2000) have documented a preference for large, deep, clear lakes with relatively low summer bottom temperatures. Enz et al. (2001) hypothesised that its absence from shallow eutrophic lakes was due to a need for deep, oxygenated water to escape from fish predation. B. longimanus can reproduce both by parthenogenetic (cloning) and gamogenetic (sexual) reproduction. Parthenogenetic reproduction occurs throughout the whole life cycle, while gamogenesis occurs at the end of a growing season and results in the formation of resting eggs capable of surviving unfavourable conditions (Rivier, 1998). 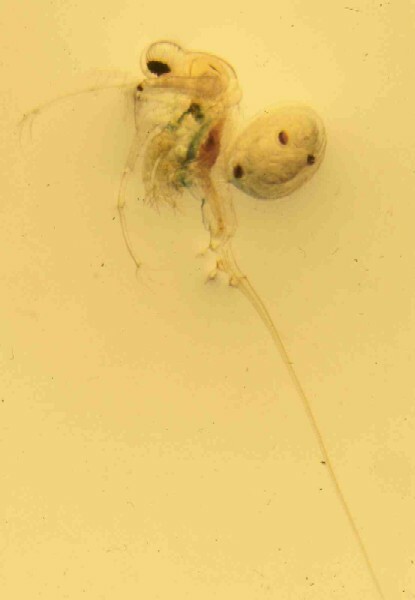 Crustaceans, and in particular cladocerans, appear to be preferred prey items B. longimanus (Schultz and Yurista, 1999), although copepods and rotifers are also apparently utilised (Schultz and Yurista, 1999; Vanderploeg et al. 1993). \"B. longimanus seizes prey with long arm-like antennae and hold them in place with its legs. One spiny water flea may consume as many as 20 prey organisms in a day\" (Berg, 1992). Recommended citation: Global Invasive Species Database (2019) Species profile: Bythotrephes longimanus. Downloaded from http://www.iucngisd.org/gisd/species.php?sc=151 on 22-04-2019. The invasion of B. longimanus into the Laurentian Great Lakes has resulted in substantial and sustained decreases in the populations of a number of (mostly cladoceran) native zooplankton species (Barbiero and Tuchman, 2004). Similar zooplankton community shifts have also been seen in Harp Lake, Ontario (Yan and Pawson, 1997). Given what is known of B. longimanus's feeding habits (e.g., Schultz and Yurista, 1999), these impacts have presumably resulted from direct predation. The impacts of B. longimanus on fish community dynamics is unclear at present. While directly competing with small fish for food, B. longimanus is also utilised as food by some fish species (Coulas et al. 1998). \"Surveys of Ontario anglers indicate that B. longimanus is widely regarded as a nuisance. With its long caudal process, it can foul fishing lines and downrigger cables, potentially resulting in the loss of hooked fish\" (Boudreau and Yan, 2004). Preventative measures: Ontario has initiated its own volunteer monitoring program for B. longimanus. Boudreau and Yan (2004) conducted an investigation to determine if the monitoring program was successful. The authors determined that, \"Volunteer monitoring programs not only benefit the parent or supporting organisation by helping carry out their mandates, they also serve a great purpose in educating the public. The best way to prevent the further spread of these organisms into Ontario's inland lakes is to educate the boaters that frequent the province's waterways.\"
Johnson (2003) has been promoting education and word of mouth in Wisconsin to prevent the further spread of the species within that state. Fliers have been posted in strategic locations, and Boaters are informed firsthand of precautions they should take in order to prevent the spread of B. longimanus. Sikes (2002) states that, \"Personal management practices for boaters and anglers include cleaning of boating equipment with high-pressure water or heated water upwards of 104ºF. Also bait buckets should not be emptied into waters, instead empty on land. Visual inspection of rigging, fishing, and anchor lines as well as the props and hulls of boats can help limit B. longimanus spread. Boats should be allowed to dry for at least 5 days before transport between lakes, but because of B. longimanus resting eggs longer periods are recommended. Boats and trailers can be towed through carwashes if exposed to infected waters for long time periods.\"
Sikes (2002) reports that, \"Current management practices for the spiny water flea seek to limit its spread to other lakes. Predictions can be made on the invasion potential for surrounding areas using the vectors of transfer, namely humans. One main factor is the lakes proximity to major roads and lakes within 3.4 km show particular vulnerability.\" The author also reports that, \"The accidental introduction of ballast water invaders like B. longimanus, the zebra mussel, and others could possibly have been avoided by ships using open water ballast exchange practices.\"
Informations on Bythotrephes longimanus has been recorded for the following locations. Click on the name for additional informations. Dumitru, C., Sprules, W. G. and Yan, N. D. 2001. Impact of Bythotrephes cederstroemi on zooplankton assemblages of Harp Lake, Canada: an assessment based on predator consumption and prey production. Freshwater Biol. 46: 241-251. Johnson, P. 2003. Spiny Water Flease Invade Wisconsin. University of Wisconsin. Saksgard, R., and T. Hesthagen. 2004. A 14-year study of habitat use and diet of brown trout (Salmo trutta) and Arctic charr (Salvelinus alpinus) in Lake Atnsjoen, a subalpine Norwegian lake. Hydrobiologia-. 2004; 521(1-3): 187-199. Sikes, B. A. 2002. Spiny Water Flea (Bythotrephes longimanus (Leydig 1860). Institute for Biological Invasions, Invader of the Month. USGS-NAS (Nonindigenous Aquatic Species Database). 2004. Bythotrephes longimanus . Center for Aquatic Resource Studies, Biological Resources Division of the Geological Survey, U. S. Department of the Interior. Summary: Introduced species impact in the North American Shield lakes. Yan, N.D., R. Girard and S. Boudreau, 2002. 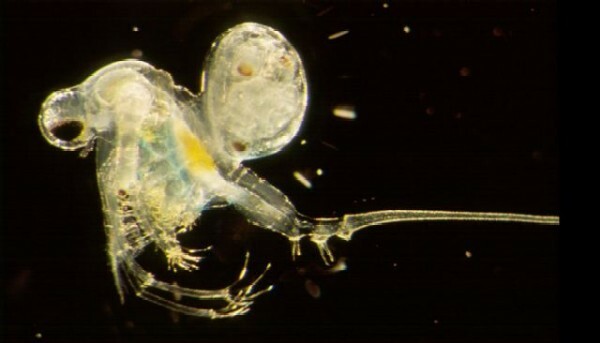 An introduced predator (Bythotrephes) reduces zooplankton species richness. Ecology Letters 5: 481-485. Summary: Spiny water flea invasion impact. Barbiero, R.P. and M.L. Tuchman, 2004. Changes in the crustacean communities of Lakes Michigan, Huron and Erie following the invasion of the predatory cladoceran Bythotrephes longimanus. Canadian Journal of Fisheries and Aquatic Sciences. 61(11): 2111-2125. Berg, D. J. 1992. The spiny water flea, Bythotrephes cederstroemi, Another unwelcome newcomer to the Great Lakes. Ohio Sea Grant, College Program: FS-049. Berg, D. J., D. W. Garton, H. J. MacIsaac, V. E. Panov, and I. V. Telesh. 2002. Changes in genetic structure of North American Bythotrephes populations following invasion from Lake Ladoga, Russia. Freshwater-Biology. 2002; 47(2): 275-282. Boudreau, S. A., and N. D. Yan. 2003. The differing crustacean zooplankton communities of Canadian Shield lakes with and without the nonindigenous zooplanktivore Bythotrephes longimanus. Canadian-Journal-of-Fisheries-and-Aquatic-Sciences. 2003; 60(11): 1307-1313. Boudreau, S. A., and N. D. Yan. 2004. Auditing the Accuracy of a Volunteer-Based Surveillance Program for an Aquatic Invader, Bythotrephes. Environmental Monitoring and Assessment, 91:17-26. Brown, M. E., and D. K. Branstrator. 2004. A 2001 survey of crustacean zooplankton in the western arm of Lake Superior. Journal-of-Great-Lakes-Research. 2004; 30(1): 1-8. Bungartz, B., and D. K. Branstrator. 2003. Morphological changes in Daphnia mendotae in the chemical presence of Bythotrephes longimanus. Archiv Fuer Hydrobiologie. 158(1). August 2003. 97-108. Charalambidou, I., A. M. Ketelaars, and L. Santamaria. 2003. Endozoochory by ducks: influence of developmental stage of Bythotephes diapause eggs on dispersal probability. Diversity and Distributions, 9:367-374. CONABIO. 2008. Sistema de informaci�n sobre especies invasoras en M�xico. Especies invasoras - Crust�ceos. Comisi�n Nacional para el Conocimiento y Uso de la Biodiversidad. Fecha de acceso. Dumitru, C., W. G. Sprules, and N. D. Yan. 2001. Impact of Bythotrephes longimanus on zooplankton assemblages of Harp Lake, Canada: An assessment based on predator consumption and prey production. Freshwater-Biology. 2001; 46(2): 241-251. Eckmann, R., M. Becker, and M. Schmid. 2002. Estimating food consumption by a heavily fished stock of zooplanktivorous Coregonus lavaretus. Transactions-of-the-American-Fisheries-Society. 2002; 131(5): 946-955. Environmental Education Network. 2004. Systematic tree of organisms: Bythotrephes longimanus. Enz, C. A., C. Heller, R. Muller, and H. R. Burgi. 2001. Investigations on fecundity of Bythotrephes longimanus in Lake Lucerne (Switzerland) and on Niche Segregation of Leptodora kindti and Bythotrephes longimanus in Swiss lakes. Hydrobiologia-. 2001; (464): 143-151. Hall, R. I. and Yan, N. D. 1997. Comparing annual population growth estimates of the exotic invader Bythotrephes from sediment vs. plankton records. Limnol. Oceanogr. 42:112-120. Haugen, T. O., and T. A. Rygg. 1996. Food- and habitat-segregation in sympatric grayling and brown trout. Journal-of-Fish-Biology. 1996; 49(2): 301-318. Ketelaars, H. A., A. J. Wagenvoort, R. F. Herbst, P. A. Van-Der-Salm, and G. A. De-Jonge-Pinkster. 1995. Life history characteristics and distribution of Bythotrephes longimanus Leydig (Crustacea, Onychopoda) in the Biesbosch reservoirs. Hydrobiologia-. 1995; 307(1-3): 239-251. Ketelaars, H. A., and L. Gille. 1994. Range extension of the predatory cladoceran Bythotrephes longimanus Leydig 1860 (Crustacea, Onychopoda) in western Europe. Netherlands-Journal-of-Aquatic-Ecology. 1994; 28(2): 175-180. Lurling, M. 2003. The effect of substances from different zooplankton species and fish on the induction of defensive morphology in the green alga Scenedesmus obliquus. Journal of Plankton Research. 25(8). August 2003. 979-989. MacIsaac, H. J., Ketelaars, H. A. M., Grigorovich, I. A., Ramcharan, C. W. and Yan, N. D. 2000. Modeling Bythotrephes longimanus invasions in the Great Lakes basin based on its European distribution. Arch. Hydrobiol. 149: 1-21. Maemets, A., M. Timm, and T. Noges. 1996. 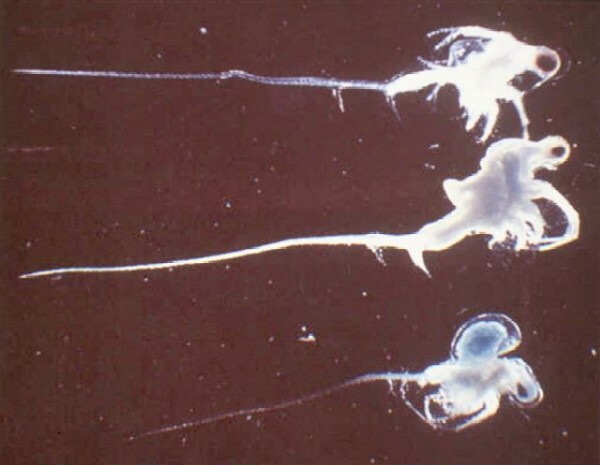 Zooplankton of Lake Peipsi-Pihkva in 1909-1987. Hydrobiologia-. 1996; 338(1-3): 105-112. Manca, M., and D. Ruggiu. 1998. Consequences of pelagic food-web changes during a long-term lake oligotrophication process. Limnology-and-Oceanography. 1998; 43(6): 1368-1373. Morrison, B. R.S. 1997. Stomach contents of trout, Salmo trutta L., caught by angling on Loch Dee, an acid water in south-west Scotland PH16 5LB. Fisheries-Management-and-Ecology. 1997; 4(3): 217-222. Nauwerck, A. 1995. The Danubian bleak, Chalcalburnus chalcoides mento (Agassiz), and its food in Lake Mondsee (Upper Austria). Limnologica-. 1995; 25(2): 91-103. Parker, S. L., L. G. Rudstam, E. L. Mills, and D. w. Einhouse. 2001. Retention of Bythotrephes spines in the stomachs of eastern Lake Erie rainbow smelt. Transactions-of-the-American-Fisheries-Society. 2001; 130(5): 988-994. Pothoven, S. A., and Vanderploeg, H. A. 2004. Diet and prey selection of alewives in Lake Michigan: seasonal, depth, and interannual patterns. Trans. Am. Fish. Soc. 133: 1068-1077. Rivier I. K, 1998. The predatory Cladocera (Onychopoda: Podonidae, Polyphemidae, Cercopagidae) and Leptodorida of the World. Guides to the Identification of the Micro-Invertebrates of the Continental Waters of the World, Backhuys Publishing, Leiden 13: 213 pp. Schulz, K. L., and Yurista, P. M., 1999. Implications of an invertebrate predator s (Bythotrephes cederstroemi) atypical effects on a pelagic zooplankton community. Hydrobiologia 380: 179-193. Straile, D. 2000. Life History And Multiple Antipredator Defenses Of An Invertebrate Pelagic Predator, Bythotrephes Longimanus. Ecology January 2000 Issue. Straile, D., and A. Haelbich. 2000. Life history and multiple antipredator defenses of an invertebrate pelagic predator, Bythotrephes longimanus. Ecology-(Washington-D-C). 2000; 81(1): 150-163. Therriault, T. W., Grigorovich, I. A., Kane, D. D., Haas, E. M., Culver, D. A., and MacIsaac, H. J., 2002. Range expansion of the exotic zooplankter Cercopagis pengoi (Ostroumov) into western Lake Erie and Muskegon Lake. J. Great Lakes Res. 28: 698-701. Vanderploeg, H. A., Liebig, J. R., and Omair, M., 1993. Bythotrephes predation on Great Lakes zooplankton measured by an in situ method - implications for zooplankton community structure. 1993. Arch. Hydrobiol. 127: 1-8. Winfield, I. J., C. W. Bean, and D. P. Hewitt. 2002. The relationship between spatial distribution and diet of Arctic charr, Salvelinus alpinus, in Loch Ness, U.K. Environmental-Biology-of-Fishes. 2002; 64(1-3): 63-73. Yan, N. D., A. Blukacz, W. G. Sprules, P. K. Kindy, D. Hackett, R. E. Girar, and B. J. Clark. 2001. 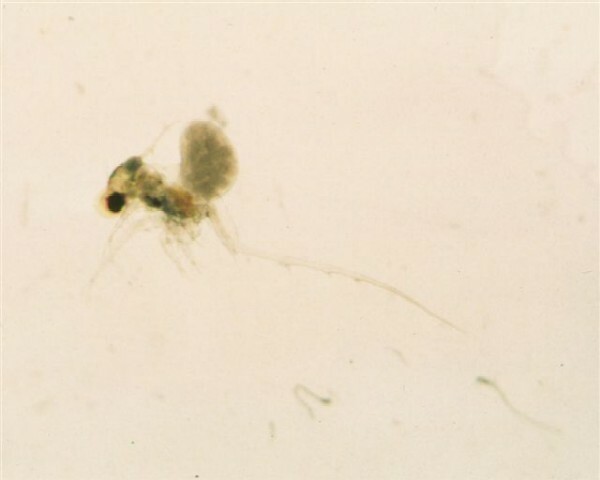 Changes in zooplankton and the phenology of the spiny water flea, Bythotrephes, following its invasion of Harp Lake, Ontario, Canada. Canadian Journal of Fisheries and Aquatic Sciences. 2001; 58(12): 2341-2350. Yan, N. D. and Pawson, T. W. 1998. Variation in size and abundance of the exotic invader Bythotrephes cederstroemi in Harp Lake, Canada. Hydrobiologia 361:157-168. Yan, N. D., Dunlop, W., Pawson, T. W. and Mackay, L. E. 1992. Bythotrephes cederstroemi (Schoedler) in Muskoka lakes: first records of the European invader in inland lakes in Canada. Can. J. Fish. Aquat. Sci. 49: 422-426. Ecology and Plankton Population Biology, Limnology, Biological Invasions, Restoration Ecology.